To celebrate the arrival of the European Manuscripts Collection earlier this year, we are very pleased to announce that we will be holding a launch event as part of the November Extended Hours of The MERL and the Special Collections reading room. The pop-up display, entitled Embellish’d with gold: treasures from the European Manuscripts Collection, will feature some of the highlights from the collection, giving University staff, students and visitors the opportunity to explore this exciting new resource. 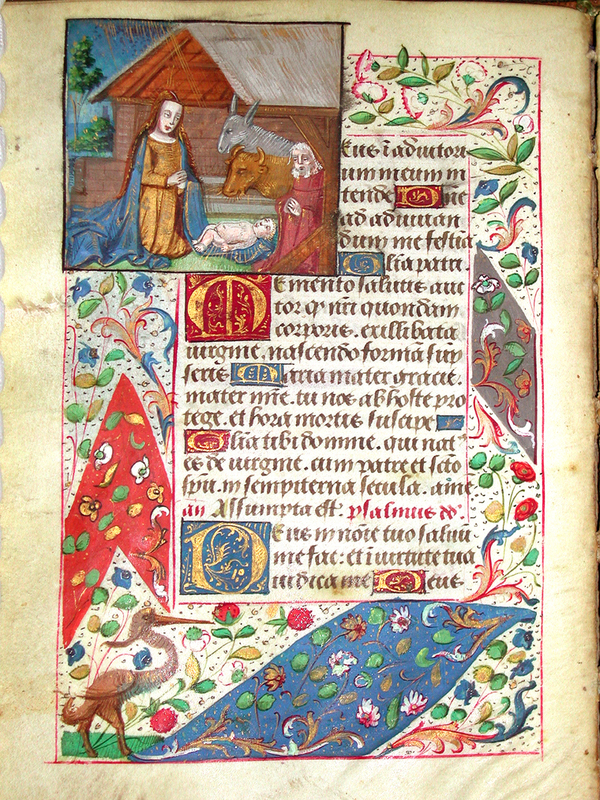 Folio 42 verso, Hours of the Virgin (Prime), with a miniature of the Nativity. From a Book of Hours for the Use of Rome, French, c. 1480-1490. University of Reading Special Collections MS 5650/43. The collection consists of 143 items, including some printed items, an exquisite seventeenth century Italian manuscript prayer book, and the centrepiece of the collection, a stunning fifteenth century Book of Hours. Most of the items are illuminated manuscript leaves, and come from a range of different types of manuscript, including Books of Hours, missals, breviaries, graduals, psalters and a papal bull from Perugia, dated 1265. The material dates from the twelfth to the seventeenth century; the items are predominately of French origin (about half of the collection), with about a quarter originating from Italy and others from England, Spain, Germany, Belgium and the Netherlands. In addition to this pop-up display, we are also planning an exhibition of items from the collection in the Special Collections staircase hall in 2019. The European Manuscripts Collection has been generously presented to the University of Reading by a private collector with the support of the Art Fund. The display will take place in the Learning Studio as part of The MERL’s extended hours opening from 5pm to 9pm on Thursday 29 November 2018. The event is free, with no booking required. This month’s extended hours opening will also feature our annual Christmas shopping evening. Come and enjoy Christmas carols by the University Choir, and make a start on your Christmas shopping with 10% off in The MERL shop! This entry was posted in Events & Announcements, exhibitions and tagged European Manuscripts Collection, exhibition, manuscripts, Medieval. Bookmark the permalink.